After the liberalization of the system by the US government, which took place in 2000, the GPS system has conquered the market for civilian use. The system is based on 31 geostationary satellites that broadcast their location to all the GPS receiving systems. The received signals are interpreted and allow defining the position of the receiver on the ground. Thanks to the development of a dedicated software system called Real Time Kinematic (RTK), we can achieve a high accuracy of approximately ± 10 mm also in elevation (i.e., in the indication of the vertical position) and in the signal output speed (about 10 Hertz). NOVAK machines are compatible with all GPS systems on the market. The operating logic is the same as used for laser systems with the only exception that, in this case, the system is driven by a GPS receiver. So you can create horizontal planes with two slopes or with variable slopes. The accuracy and the final result obtained with this technology are inferior compared to those obtained with the laser systems because the GPS is less accurate by its nature, and is furthermore subject to periodic variations related to changes of the satellite constellation which occur every 12.50 minutes. The advantage of this system is a great flexibility and ease of use, especially on large lots of land and with varying slopes. It is often used in the agricultural field, in construction work for large-scale earth movements. 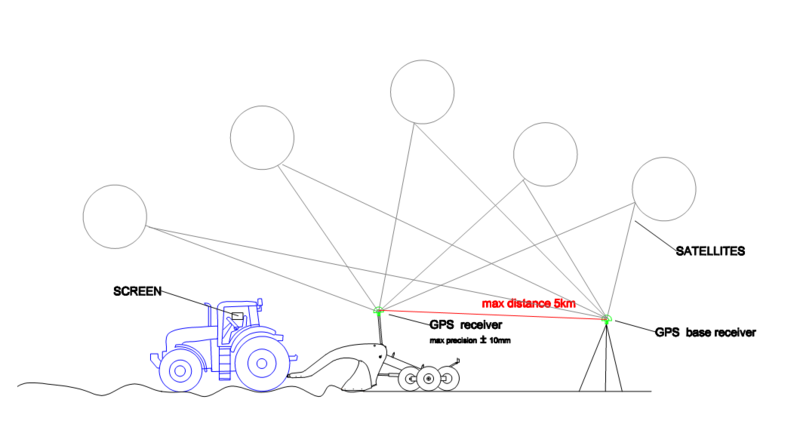 The GPS systems are equipped with two receivers: one vehicle receiver (mobile base) that is installed on the grader, and a fixed receiver (static base) serving as a differential reference, since the latter defines the difference in displacement between fixed station and mobile station. A monitor placed in the cabin next to the operator displays the data processed by the software that controls the electrical and hydraulic height commands of the blade. This system achieves a horizontal and vertical positioning accuracy of about 1 cm covering distances of up to 5 km between the two receivers. If the distance exceeds 5 km, the accuracy will decrease.